I don't usually post movie reviews on this blog but for some films—especially documentaries—I'll make an exception. As my wife and I watched the Netflix documentary “The Rachel Divide,” I remembered some of the thoughts and feelings that I had when I first learned of Rachel Dolezal being outed as a white person pretending to be black. My initial reaction was one of contempt, simply because that’s how I feel when it comes to disingenuous people in general. The more I learned about her from the occasional news story or interview, that contempt was just reinforced. When I learned about the documentary, I tried my best to set aside my personal feelings and to be objective. To hear her out and try to understand where she’s been coming from. Her life story offers some insight into why she thinks the way that she does and I am not without empathy and sympathy for the way she claims that she and her siblings were raised, or the abuse she claims to have endured during her upbringing. 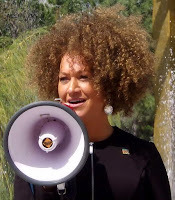 There is some skepticism about these accusations, simply because of the lies and misdirection she’s become known for, but I’m hesitant to dismiss any possible instances of abuse because the initial accusations were from her adopted sister and not Rachel Dolezal herself; Emotional abuse is also something that I have personally endured so I’m willing to give people the benefit of a doubt when it comes to such experiences. I felt sorry for Dolezal’s youngest son, Franklin (who doesn’t share the Dolezal surname), who is seen in the film feeling openly exasperated and embarrassed by his mother’s behavior. As a filmmaker myself, I could identify moments in the film where footage that would normally be discarded was used to narrative effect. There was a point during an interview with Franklin where he said that he did not want to continue talking. He didn’t seem angry, just frustrated and burned out. The film cut to a close-up of Franklin’s hands as he wrapped the microphone cable around the transmitter he was wearing. The moment appeared to be evocative of every interview with a person caught in a lie or being asked a question they may have explicitly said they would not answer beforehand, as they removed their microphone on live TV or as cameras continued to roll, exclaiming, “This interview is over!” The fact that the editor of “The Rachel Divide” chose to follow the shot of wrapping the cable around the transmitter with one of Franklin just sitting on the same chair in silence, looking contemplative and sad, showed that they were not trying to create additional drama in the narrative where it didn’t exist and wasn’t needed. They could just as easily have cut to footage of Franklin leaving the room to imply that he left in anger but—to the credit of the filmmakers—they didn’t. The film showed a number of pieces of art that Dolezal had created over the years which I personally thought were very good. Dolezal was also shown styling hair not only for herself but for African-American women (I almost wrote “other African-American women" but I stopped myself). She seems to have some talent in that regard and claimed that she didn’t lose any clients as a result of the controversy in the media. Update: It turns out that Dolezal has been doing much better than just getting by. That she was earning money and allegedly concealing this fact from the state of Washington only serves to undermine any sympathy shown toward her. The reason for her occupational tunnel-vision seems obvious to me. It also seems to have been a major factor in every other aspect of her life, from her activism to her social media habits, to her desire to participate in a documentary that’s all about her. She comes across as a textbook narcissist. I’m not saying this in a judgmental or diagnostic way, I’m saying it as a recovering narcissist myself. Those of us who have acknowledged our own narcissism can be pretty good at spotting it in others. Her constant need to step into a spotlight—even when she knows that she’s opening herself up to judgment and ridicule—the “victim” label she dons after those appearances, after getting turned down for a job and after she’s criticized and harassed on social media. This can be seen as narcissistic behavior. She complains about all of it but does nothing to change it. She’s asked why she doesn’t just remove herself from social media altogether if people are constantly attacking her and her children and her reason is that she thinks it’s the only part of her life that she has any control over. I’d believe that if she chose to delete her Facebook and Instagram accounts (and whatever other platforms she’s part of). If she actually quit using them, that would be taking control, especially when she says that she wants to be able to live a private life, but she isn’t doing that. I suppose she has control in the sense that she chooses what to post on social media but she certainly has no control over what other people have to say about it. The film shows a time-lapse sequence where she’s working on a painting and repeatedly taking breaks to look at her phone—ostensibly checking her social media feeds—appearing to be upset and even crying. None of this is surprising to her since she complains about it constantly. I think that the control she thinks she has is in the knowledge that whenever she posts something on social media, she knows that someone is going to attack her and when she’s attacked, she can claim to be a victim. If she were to remove herself from the situation, she would lose her victim status, something she obviously doesn’t want to happen. So what she thinks she “controls” is her status as a victim, because she can maintain it simply by participating in social media, where she knows that she is a pariah and she embraces it in a very twisted way. I came away from this documentary with very mixed feelings about Rachel Dolezal. I felt genuinely sorry for her children and what they’re going through—honestly, what their mother is putting them through. I felt sorry for Dolezal for the abusive upbringing that she described—at least those elements of her story that were corroborated by her siblings. But I don’t have sympathy for the difficulties that she endures as an obvious result of her own choices and behavior. The film crew then followed her into a government building where we learn that she is going to legally change her name. It certainly seemed like a good idea, especially if she’s having trouble finding work. Losing the Dolezal monicker would at least help her on paper. Again, I optimistically thought that maybe she was going to go for something new but practical, something that would help her put the past behind her, something that would be beneficial to her and her children. It couldn’t possibly be the job application poison that she managed to turn “Rachel Dolezal” into. One would think that a woman who has spent so much of her time as a champion of social justice would be aware of racial bias against job applicants whose names are perceived to be "black" or ethnic. Based on what I've come to know about her based on this documentary alone, she is most-likely well aware of the challenges that this new name will present and I'm sure she won't hesitate to use it to reinforce her victim status.